Cambridge Collaborative, a partnership between MIT, Harvard University, and the Cambridge License Commission, has been awarded a $40,000 Alcohol Prevention Planning and Implementation Grant by the Massachusetts Governor’s Highway Safety Bureau. Harvard and MIT have agreed to splitting the grant “rather than using it jointly,” said Shannon N. Nees ’07, a member of the Cambridge Collaborative. 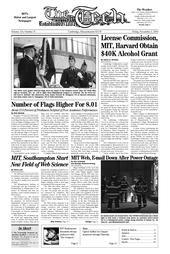 MIT intends to use its portion of the money to support a carnival in the spring, said Ryan Travia, director of the office of Alcohol and Other Drug Services at Harvard University, and a member of the Cambridge Collaborative. Harvard plans to use its share of the grant for alcohol abuse prevention programs during the festivities surrounding the Nov. 18 Harvard-Yale football game because this is a “high risk time for alcohol abuse,” said Travia. The Cambridge Collaborative “serves to advance the concept that alcohol issues are a community issue,” said Daniel Trujillo, associate dean for Community Development & Substance Abuse Programs. To effectively address dangerous drinking, programs also need to focus on environments “that may facilitate or promote high risk drinking,” Trujillo said. The Collaborative is one of seven partnerships in Massachusetts to receive the grant. The grant was awarded in summer 2006 and must be used by June next year, Travia said. Travia couldn’t say if the Cambridge Collaborative would apply for a grant next year, and said he was not sure if the money would go towards the same projects if the grant was received again. MIT, Harvard, and the CLC have been “collaborating for some time now,” and the collaboration was in place when he joined Harvard in Aug. 2005, Travia said. The grants were made possible by a federal grant from the Department of Justice, which is sponsoring other similar programs across the country, said Rebecca Donatelli of Massachusetts Governor’s Highway Safety Bureau. Last year, the first year of the program, recipients in Massachusetts received $5,000 each. The Governor’s Highway Safety Bureau is sponsoring this program because they want “to do some alcohol education with the schools” involved and “to get alcohol awareness in the community,” Donatelli said. Other colleges in Massachusetts that received this grant include Dean College, Quincy College, University of Massachusetts at Lowell, Assumption College, Massachusetts College of Liberal Arts according to Donatelli. A press release announcing the grant names three MIT students and five Harvard student members of the Drug and Alcohol Peer Advisors group (DAPA) as members of the Cambridge Collaborative. One of the Harvard students is a freshman who is interested in the issue and offers a “freshman perspective,” said Travia. Other members are Travia, Trujillo, a representative of the CLC and a representative of Massachusetts MADD (Mothers Against Drunk Driving).